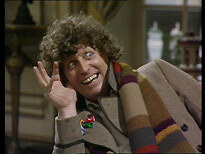 By 1979, when this four-part story was made, Tom Baker was nearing the end of his tenure as the Doctor. He'd made more episodes than Patrick Troughton, precisely as many episodes as Jon Pertwee, and was a couple of stories away from passing William Hartnell as the most prolific actor to play the role. The show, and Baker in particular, had been embraced by a new generation of fans; merchandising was plentiful, thanks in no small part to a tin dog named K9; and ITV was on strike. It's not surprisingly, then, that the show was racking up record viewing figures. Some would argue, though, that Doctor Who was past its creative peak. Spiralling inflation and budget cuts were taking their toll, and the show had been cowed by Mary Whitehouse's bruising attacks on it's gothic violence. 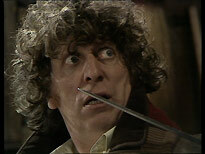 Most fans agree that City of Death is one of the best Doctor Who stories of the 1970s. It owes the lion's share of its reputation to its its author, a promising young chap named Douglas Adams. You may have heard of him. City of Death had a troubled production path. It had mutated from a complex script called A Gamble With Time, written by David Fisher. It was decided that the story needed a substantial re-write to bring it within Doctor Who's reach, but Fisher wasn't available. The task fell to Adams, who would have to re-shape the story in a matter of days. The resulting story is about an alien creature, Scaroth, who is stranded on Earth when his space-ship explodes, in the Palaeozoic era. The explosion splinters his being, scattering his persona through time. For centuries his various incarnations have been using his advanced scientific knowledge to manipulate mankind's evolution, so that he'll eventually be able to build a device to reconstitute himself, and finally escape. He funds this work by acquiring artwork and books, and selling them hundreds of years later when they have become valuable antiques. 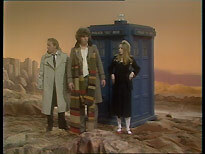 In Paris, in 1979, Scaroth is masquerading as Count Scarlioni, and his experiments in temporal manipulation have begun to create fractures in time, which brings his activities to the attention of the Doctor, who is visiting Paris with his Time Lord assistant, Romana. Even after Adams's re-write, City of Death is a very ambitious story, and simply bursting with his formidable talent. It has a strong plot, robust production values (it's enhanced enormously by some very cost-effective filming in a number of Paris locations), and sound direction, by third-time Doctor Who helmsman Michael Hayes. Tom Baker is in fine fettle as the Doctor, enjoying sparkling rapport with his assistant, Romana, played by the charming Lalla Ward. 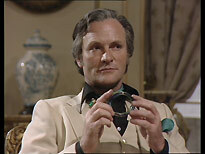 The story also boasts a strong guest cast, led by suave Royal Shakespeare Company actor Julian Glover, a mere two years away from starring as the villain in the Bond movie For Your Eyes Only. The story also features Catherine Schell, fresh from her year as a shape-shifting alien on Gerry Anderson's Space: 1999, and experienced character actor Tom Chadbon, who had recently appeared in the BBC's science-fiction space opera Blake's 7. Within eighteen months Doctor Who's fortunes had changed significantly. Adams had moved on, finding fame and wealth beyond the dreams of analysts with The Hitchhiker's Guide to the Galaxy; a new producer had revitalised the show, with the help of a budget increase; and Tom Baker had passed the reins to Peter Davison. An era was over, and City of Death was one of its brightest jewels. Because this is something of a special release, (and, presumably, because the series is enjoying its highest profile ever, and because it will be the last Doctor Who DVD released before Christmas), 2 Entertain and BBC Worldwide have allowed City of Death the luxury of a two-disc edition. This was a very smart decision. Normally a four-part Doctor Who story is released on a single disc, with about an hour's worth of bonus material, (to ensure the picture quality doesn't suffer too much). Releasing this story on two discs gives the episodes plenty of room, and allows for a whole disc of bonus material. The story was originally recorded on 2" PAL quad videotape, a format that was phased out a couple of years later. The master tapes include a mixture of material shot on location (on 16mm film) and material shot in the studio (on videotape), as was usual for the BBC in those days. This practice usually resulted in very high-quality well-lit studio footage, and slightly murky, often flickery, and usually dirt-speckled exterior shots. Happily, Doctor Who has a loyal group of technical experts dedicated to improving the creaky old master tapes (and films), the Doctor Who Restoration Team. They've given the story a wash-and-brush-up, and the result is a story that undoubtedly looks better now than it would have in 1979. This is especially noticeable with the filmed inserts. A detailed article about how this was achieved can be found here. Generally the image quality on the new disc is remarkably good, especially considering the series was made more than quarter of a century ago. Detail, colour balance and contrast for the studio scenes are all typically excellent. The film sequences are stable, have naturalistic colour, and are practically free of signs of wear and tear (and dirt!) There are a couple of sticky patches, though. 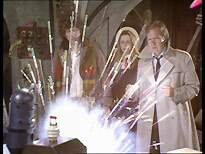 Some of the darker studio scenes (the Count imprisons the Doctor, Romana and Duggan in a gloomy cellar at one point) struggle a little; and there are signs of a video fault called "banding" (horizontal bands of differing intensity and noise levels) in the Paleozoic Earth scenes at the end of the story, but they were probably there when the series was recorded, and it would have been very difficult to fix them (just about anything is fixable, if you throw enough money and resources at it). Under normal viewing conditions, no-one has any right to grouch. The bitrate isn't easily determined (the usual software tools aren't giving an accurate average). It can be estimated by on-the-fly measurement, though: it hovers around the 8.8-9.0Mb/sec region, and it shows. On a reasonably-sized screen most viewers should be able to see the difference that a high bitrate can make. Comparing the well-lit studio scenes of City of Death to similar recent discs, of similar provenance, like the PAL episodes of Claws of Axos, or Horror of Fang Rock, the difference is quite noticeable. The audio is standard BBC mono (at 192kbps), which is to say that it's generally fine. This too, has been expertly tweaked, and there are certainly no significant flaws to report. The four episodes have English subtitles. Sadly there are no subtitles on the accompanying commentary track, because of a recent money-saving policy change made by 2 Entertain. There are subtitles on the bonus materials on the second disc. If you've seen any of the BBC's classic-era Doctor Who discs you'll know what to expect from the menus. They're all very similar. It's a rather ugly template, and now very dated, but reasonably functional. There are two bonus features on the first disc: the Production Notes subtitles, and an audio commentary track. The main benefit of choosing people who only worked on one or two Doctor Who stories is that they tend to remember things! If you worked for a company for several years, you're unlikely to remember a couple of specific weeks, if they were much the same as all the others. Hayes, Chadbon and Glover prove to be a good combination, prompting each other's memories. It's not one of the best commentaries, but it's quite amiable. The Production Notes subtitle stream, written by the estimable Dr Martin Wiggins, provides some well-researched and learned trivia, presenting some hard facts to compensate for the commentary track participant's hazy memories. These play throughout the entire story, with barely a hesitation. The key bonus feature is a superb forty-five minute documentary, titled Paris In The Springtime, produced by Ed Stradling. It tells the story of City of Death, from the original script (which is amusingly re-told in synopsis form, with the help of some illustrations by Jason Lythgoe-Hay), to Adams' re-writes, to the location filming in Paris, to the studio filming back at Television Centre. It features interviews with many of the story's production staff, (notably absent is the show's producer at the time, Graham Williams, who died in tragic circumstances in 1990). The documentary also includes footage from two interviews with Douglas Adams, which cover his time on Doctor Who in general, and his work on City of Death in particular, in some detail. Other contributors include Catherine Schell (interviewed in France), former script editor Anthony Read, A Gamble With Time writer David Fisher, and Pennant Roberts, who directed Adams' earlier contribution to the series, 1978's The Pirate Planet. Two writers from the Christopher Eccleston series of Doctor Who also pay tribute to Adams' talents, Steven Moffat and Rob Shearman. The documentary has a witty script (by experienced Doctor Who book author Jonathan Morris), which is expertly delivered by Toby Longworth (who has appeared in numerous Big Finish audio plays). It's a very polished production, well up to broadcast standard. Paris, W12 is a twenty-minute compilation of material salvaged from four hours' worth of raw studio feed footage, rescued from an archaic domestic video recording format. The black and white footage has been painstakingly restored. There are flaws, and they're quite disruptive by normal standards, but the material is fascinating, and such distractions are easily ignored, under the circumstances. The footage provides a priceless glimpse into the recording process, and includes many moments that will thrill Doctor Who fans. Only a handful of recordings of this type are known to survive. Some of them have already been included on other Doctor Who discs (on The Talons of Weng-Chiang, for example), but this is by far the most interesting. Whatever stalwart efforts and costs were expended to rescue this footage were well worthwhile. 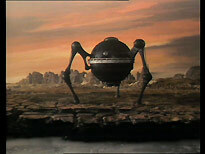 There are two short items of visual effects unit footage presented on the disc: Prehistoric Landscapes (which shows Ian Scoones' excellent scale model work for the primeval Earth spaceship explosion sequence), and Chicken Wrangler (which shows Scoones struggling with various chicks and chickens, for a sequence where an egg is aged in a time bubble). Both of these were sourced from 35mm off-cuts discarded by the BBC, and rescued by fans. The quality is excellent, especially considering that they've passed through various hands over the years. 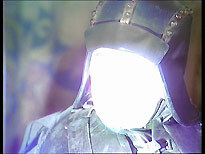 In both cases the mute film has been paired with appropriate sound effects or music, to good effect. Both run under three minutes, and don't overstay their welcome. A Photo Gallery groups together dozens of photo's from various sources, some of them quite rare, and presents them, slideshow-style to sound effects from the story. There are no huge surprises, but it's a nice feature, nevertheless, and helps to make the disc a definitive archive for the story in question. Eye on Blatchford is a thirteen-minute spoof from the same team that produced the Oh Mummy! skit on the Pyramids of Mars DVD. It recounts the day-to-day life of Sardoth, the second-to-last of the Jagaroth. 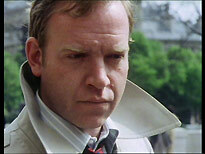 It's safe to say that if you didn't like Oh Mummy!, you'll hate Eye on Blatchford. There are some wonderful sequences (chiefly one featuring the delightfully barmy Gabriel Woolf (Sutekh in Pyramids of Mars) as a dotty professor), but these are countered by others that would shame a sixth form video. The idea behind the skit is stretched somewhat, and the production values are very patchy (some elements are very impressive, others a bit embarrassing). Still, it's a bit of fun, and even if you only watch it once, you should get a few laughs out of it (you might get a few more if you keep your finger poised above the pause button, to catch some fleeting text gags). I hope director Mark Frost and producer Matt West and their team contribute to other Doctor Who discs, but will perhaps acknowledge that a firmer editorial hand may benefit their work. The disc also contains a PDF file, offering scans of the 1980 World & Whitman Doctor Who annual. The scans are of very high quality (it's a shame you can't say the same about the original artwork!) It's a very simple bonus feature, but it's been perfectly implemented. There are (at least) four Easter Eggs. 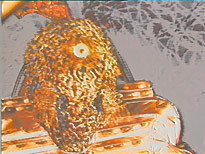 The first appears at the very end of the final episode: it's a recording of the original BBC continuity announcement for the next story, The Creature From The Pit. The others can be found on the second disc, on the main menu page. The first is a spoof video instruction manual from the Jagaroth Battlecruiser Inc company. This is another production from the Eye on Blatchford team, and takes advantage of the CGI Jagaroth ship model created for that short. The second is a six-minute interview with Douglas Adams, who recounts an amusing anecdote about a drunken trip to Paris that Douglas made with another Doctor Who director, Ken Grieve ("one of the world's most stupendous and marvellous p*** artists"). The third is Good Woolf Bad Woolf, a two-minute outtake from Eye on Blatchford featuring the great Gabriel Woolf. 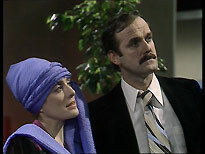 Finally, there's a classic gag taken from one of the legendary in-house BBC Christmas Tape compilations, featuring Tom Baker and John Cleese on City of Death's Louvre set: "Tom, sorry to bother you. Sign this for my little godson, would you? Nice little kid, he's blind..."
City of Death is one of the best Doctor Who stories, from any period of the show's long history. The DVD boasts an almost perfect presentation of the four episodes. The marvellous package of bonus material offers something for everyone, from the most casual fan, to the most dedicated. The Paris In The Springtime documentary is highly impressive, and the Paris, W12 footage the disc's piece de resistance. The commentary and Production Subtitles are perfectly complementary, and provide excellent value for money. The other bits and pieces are the icing on the cake. City of Death is another excellent DVD from the Doctor Who Restoration Team, 2 Entertain and BBC Worldwide!